We left at 5:00 AM sharp after a smooth weighing of the anchor and a quiet departure out of St. Pierre. We motored half way out of the bay, and then raised our mainsail. As we got out of the bay, we motored along a bit, and then picked up the wind coming out of Forte de France and started sailing. 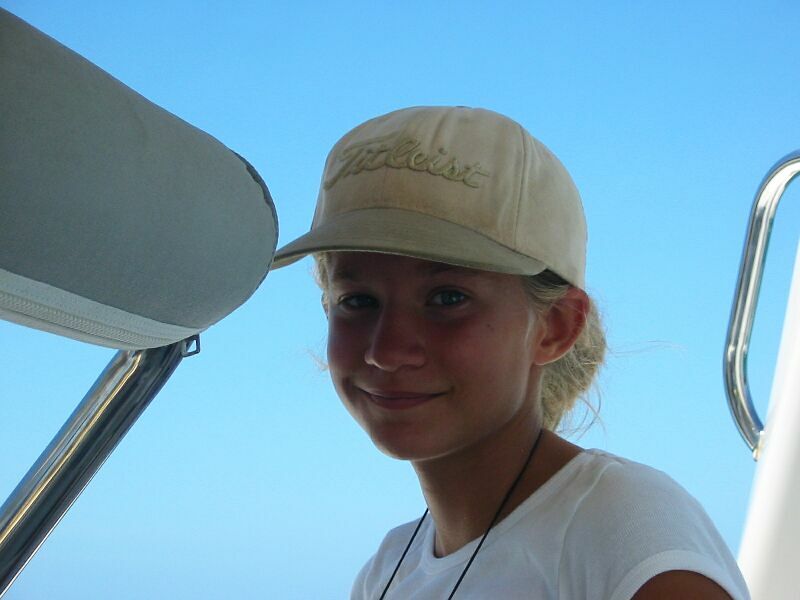 As were going down the coast of Martinique the girls did Kidsnet on SSB. Shortly after they finished someone hailed us on the VHF. That was strange because the VHF only has a range of about 10 miles and we didn't see anyone within eyesight of us. It turned out it was a boat with kids on it called Pegasus. They had listened to us on Kidsnet (they have a receive-only SSB radio), and figured we might be close by. Pegasus was sailing around the SW tip of Martinique towards Marin. They had heard about us from other kid boats. We talked and told them our itenerary and decided we might run into them later. That was a unique experience. We sailed from Martinique all the way to half way down St. Lucia. We averaged 8.3 knots the whole way. The winds were nearly a beam reach and the seas were mostly off the beam. So, we had a mostly smooth sail. 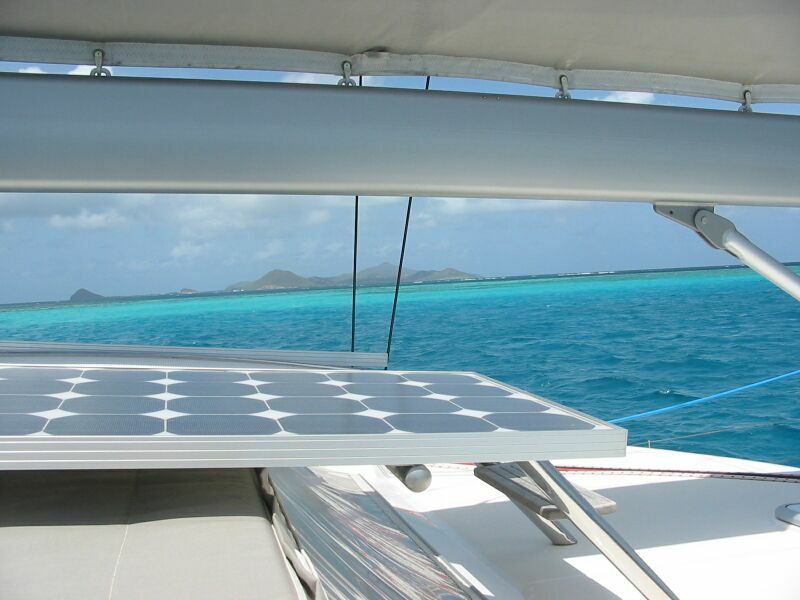 We actually only had to motor about 35 minutes in the lee of St. Lucia before we picked up sailable conditions again. So, we kept our average speed up. In St. Vincent we tried to get closer in to the island, so we had the motors on a fair bit. The winds were actually there most of the time, but a bit shifty. We wanted to insure we arrived before dark in Bequia so we kept motoring anyway and just let the wind in our sails pick up our speed. 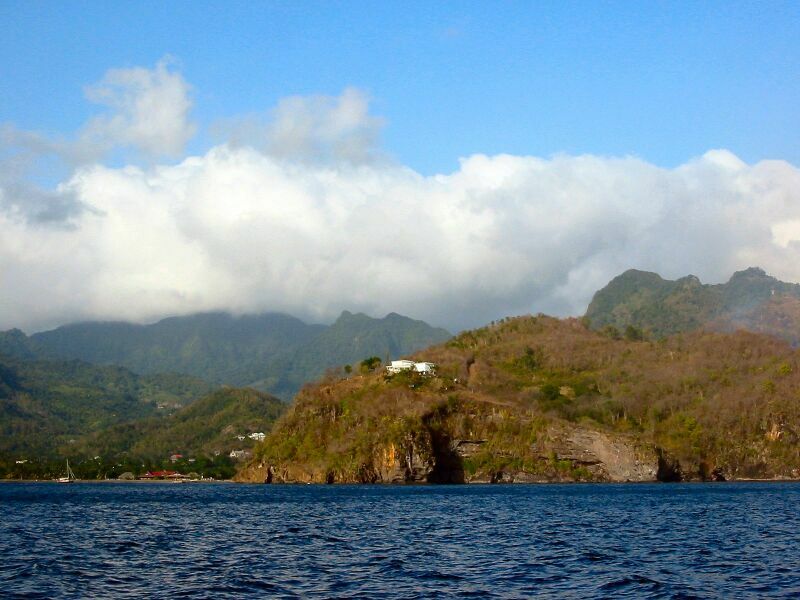 Frank sailed us more eastward along the SW coastline of St. Vincent. He knew we'd have current and shifting winds going to Bequia. 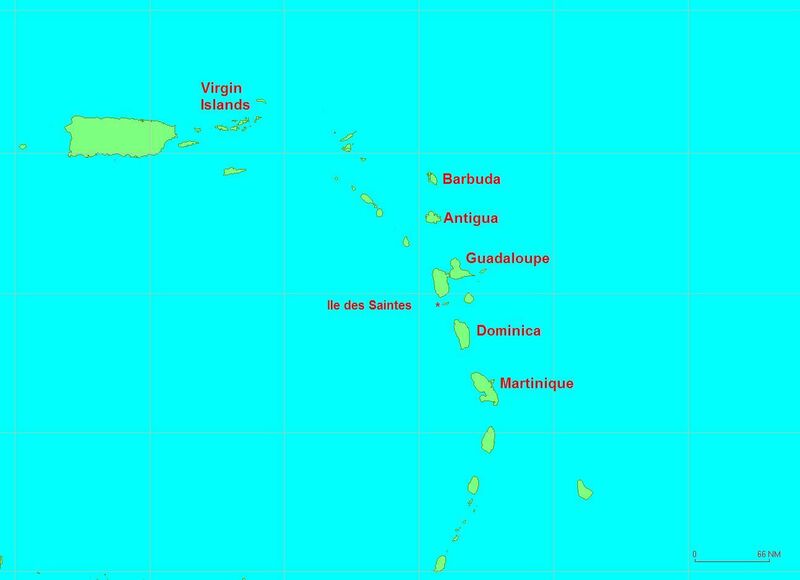 We got far enough east that we made Bequia with out any close reaching. Experience actually helps. We were double reefed for the first half knowing that the winds can really pick up. But this time the winds were steady so Frank eased out the reefs as we got closer to Admiralty Bay. We pulled in at 6:15 PM and dropped our sails and set the anchor in only 5 feet of water. We arrived at about 6:20 PM, 110.2 miles and an average of 8.3 knots! Especially good speed since we had some counter current for lengthy periods of time, but no current in our favor. Very nice sailing. It was Mother's Day today, but we all decided we would celebrate it on another day. It was too big of a sailing day to try and do anything today. Karen and Frank did send Mother's Day e-mails to our mothers. We spent a few days in Bequia. On Monday, Frank spent some time writing web pages and went ashore and updated the web site. He also did some shopping in the chandlery here to get boat stuff and fishing lures. Karen worked all day with the girls on home schooling. We basically just had a work day. Fortunately, we got some rain that night and it cleaned off the salt on the boat for us. We did home schooling again on Tuesday morning and Frank wrote some more web pages. Again he went ashore and uploaded the web site. We traded some books at one of the stores onshore. 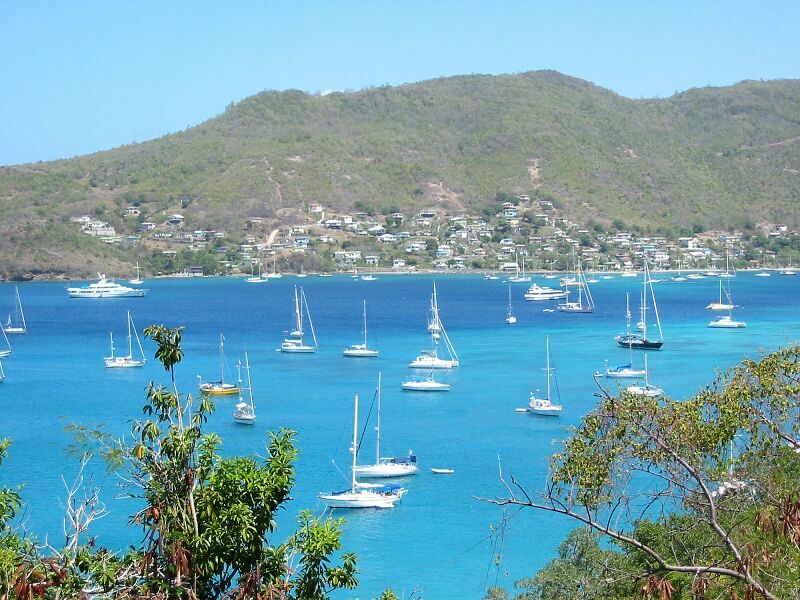 This time, Frank went with Karen to the market in Bequia. She was overwhelmed by their aggressive selling last time. Frank said he'd handle it. Well, even Frank was overwhelmed by these guys. He had to ask them to slow down - otherwise they would have stuffed our bags with every vegetable or fruit we stared at! As it was, we got a $100 EC (about $40 US) worth of fruits and vegetables in about 4 minutes. Back at the boat, Frank did some swimming and cleaning on the bottom of the boat. We planned to go to Mostique the next morning. Well we let the anchor stay in place and Frank went ashore and tried to buy bolts that would fit since the bolts were bent. He got some the right dimensions, but had to hacksaw them to the right lengths. Frank had no confidence the bolts would hold since the threads were yanked out. But, he tried to put them on anyway. Two of the bolts seemed pretty tight. After 2.5 hours of effort, we tried to lift anchor again: wham! (Not as hard this time, we were careful). No good, it yanked out again. So, we carefully tried to use the windlass to pull up the chain. We got most of it up, but Frank had a couple of times when his hands got banged up trying to hold the windlass down. It took about 30 minutes, but we finally manually pulled the last 10 feet up and got the anchor on board. Whew! We decided to press on and use our second anchor until we could get the windlass repaired. Our second anchor is a large, but quite light Fortress anchor with a long rope rode and about 12 feet of chain. Frank can deploy it by himself. 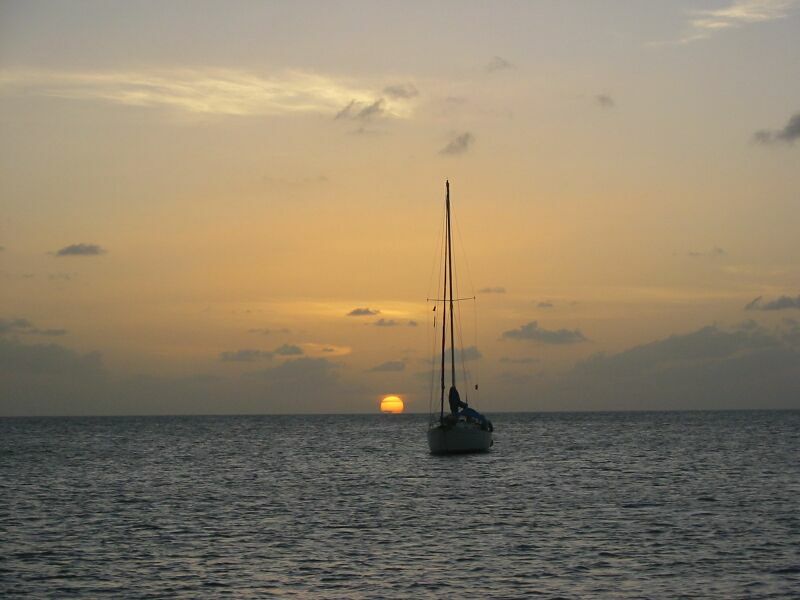 Besides, Mostique is a mooring only "anchorage" so we went ahead and sailed to Mostique. We got to Mostique a little after lunch time and relaxed a little while. Then Frank and the girls left to go to our favorite beach at Macaroni Bay. Frank was sure we could catch a ride like we had before, but for some reason there weren't as many people going by or offering rides. So, we ended up walking the whole way (about 1.5 miles each way). The winds made the waves pretty choppy, but we still caught a few good ones. Again, we didn't catch a ride on the way back. Frank took a lot of grief from the girls for not taking a taxi. We did some homeschooling the next day. Frank did some snorkeling offshore for a while. We all did some reading and relaxing the rest of the day. Karen cooked up a nice meal of ribs, corn and cole slaw for dinner. We woke up later that evening to watch the lunar eclipse. It was beautiful! On Friday, Frank got up early and did some maintenance on the engines. Frank was a bit concerned about some oil he found in the starboard engine. He checked everything over, but didn't find any serious problems. Did some basic maintenance and then cleaned up. After breakfast, Frank and the girls went ashore again. Karen wanted to stay and take a nap on the boat. This time we took a taxi to the beach. We arranged for the taxi driver to pick us back up at noon. After playing on the beach a while, Catherine suddenly remembered she was going to be the net controller on Kidsnet at noon today. So, we had to walk all the way back again since the taxi driver wasn't supposed to arrive until noon. We found the taxi driver at the restaurant and explained we wouldn't need him to pick us up. Then we went back to PatiCat so the girls could do Kidsnet. 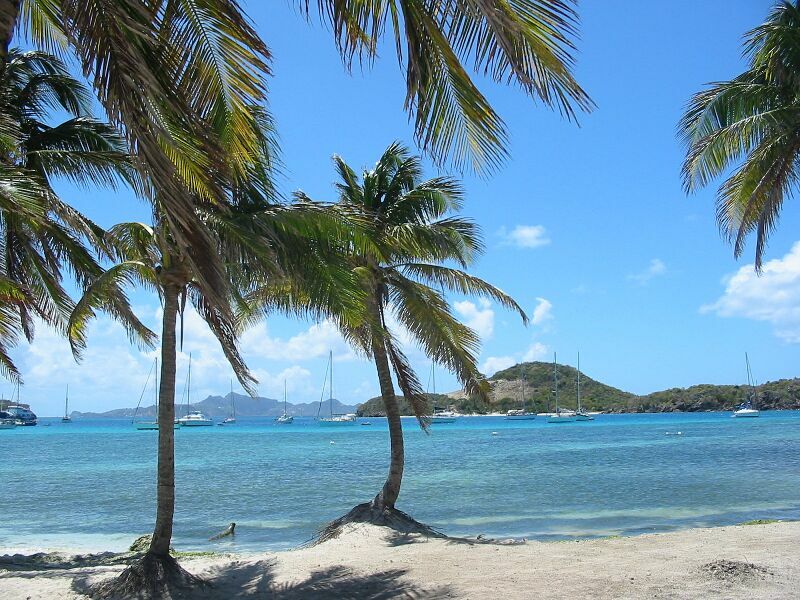 Later, we dropped the mooring ball line and departed to sail for the Tobago Cays. The winds picked up as we went along and we averaged 8.5 to 9 knots the whole way. We even hit 11.7 knots at one point. We sailed past Petite Canuon and then past Canuon. 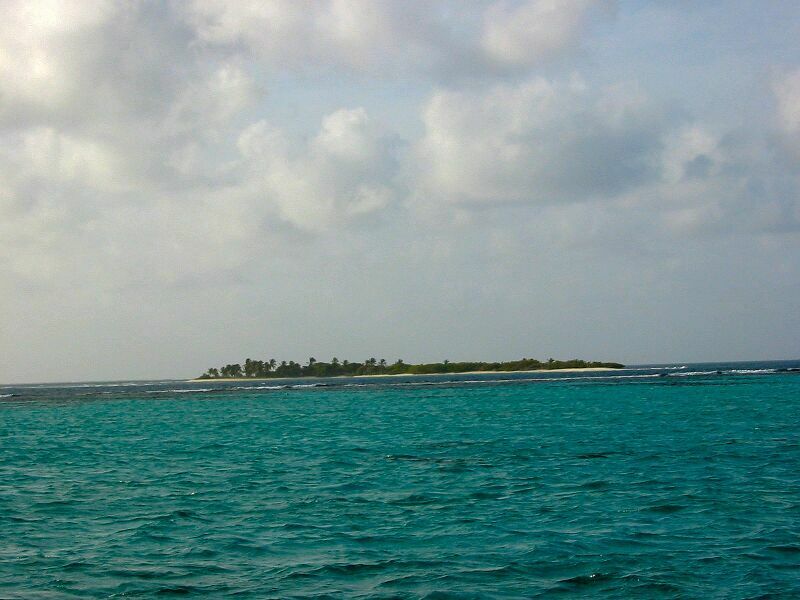 Then we sailed right through the break in the reefs on the NW side of the Tobago Cays. There were still a fair number of boats at the Cays, but we found a nice spot in the shallow areas and Frank deployed the light anchor in about 7 feet of water. Frank dove over to check the anchor and it was holding just fine. We got an E-mail from Hotel California in the evening. They planned to be in Tobago Cays in a couple of days, so we hoped to see them before we left to go back North to meet Frank's Mom in Antigua. 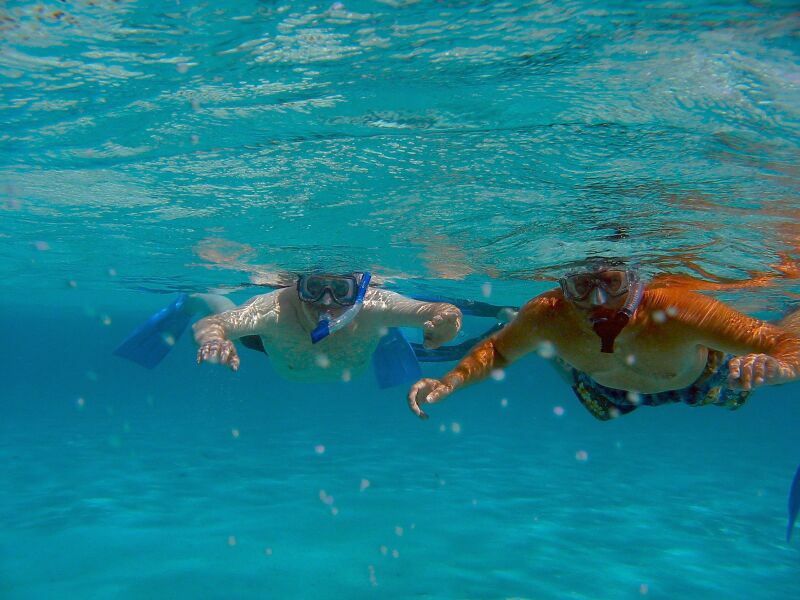 The snorkeling in Tobago Cays is wonderful. The next day Frank and the girls snorkeled in several places. 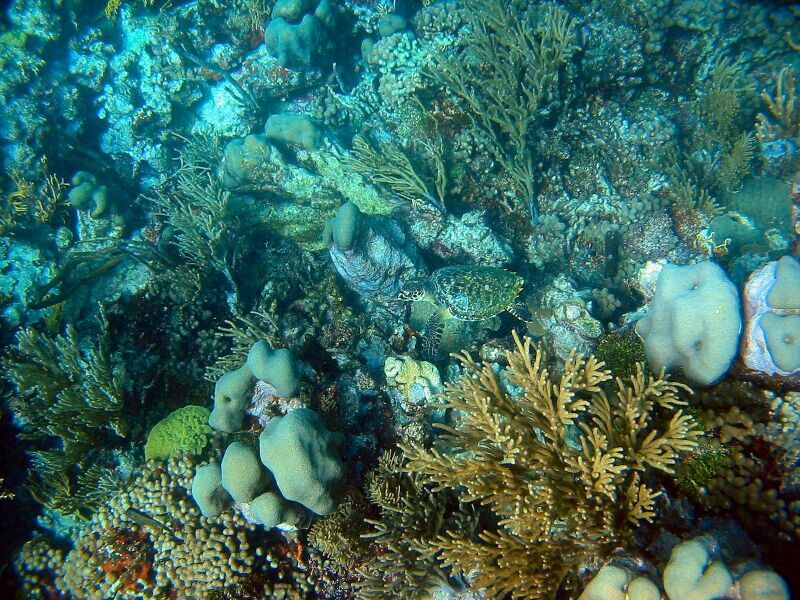 We did inside the reef, then outside the dinghy passage to the outside of the reef. Then we took the dinghy over to a little island called Petit Tabac which we had missed last time. We even went ashore and walked around a bit. 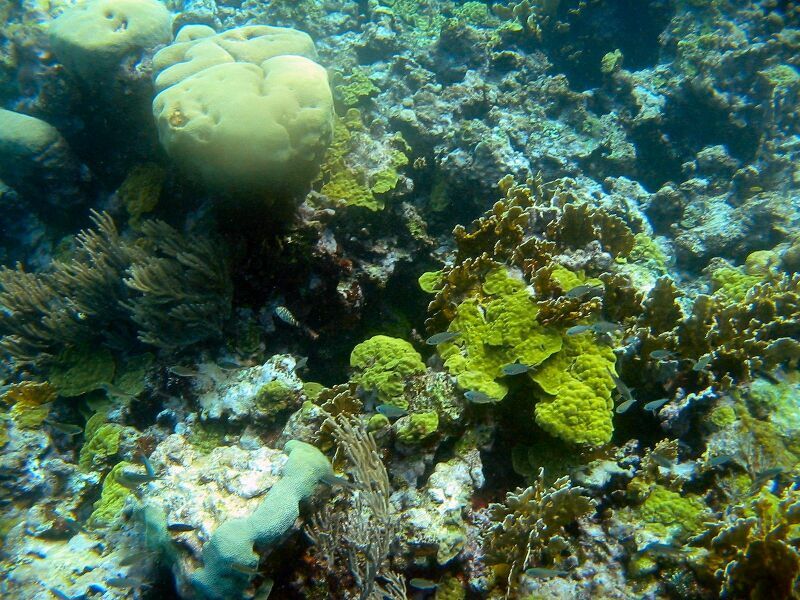 The snorkeling here was even more pristine. We did a mix of homeschooling, reading, relaxing, and boat chores the rest of the day. The next day Karen gave Frank another haircut. As usual, this resulted in hair all over the back of the boat. But, this gave us the excuse to wash down the back of the boat, so we used salt water to wash things down, and then used fresh water to rinse. We ran the watermaker to refill the tanks. This activity helped get us started on the cleaning we needed to do in preparation for Nana's visit. A little after 4:00 PM we spotted Hotel California (HC) arriving as planned. They anchored right near us and invited us over. We all went over and met Wilson's father - Victor. We had a nice time chatting until well after sunset. We had a lot of catching up to do. Wilson told us an interesting story about their trying to anchor in Dragon Bay, Grenada. They went there Friday evening after picking up Wilson's father. As they approached, a bunch of local Grenadians on the beach started making "shooing away" gestures to them. Wilson could tell they weren't being nice, but wanted to understand what was going on, so he dropped his dinghy (not his anchor) and went towards the beach (not all the way in). He asked them what was up - they said they were fisherman and if HC were to anchor there it would scare away their fish. 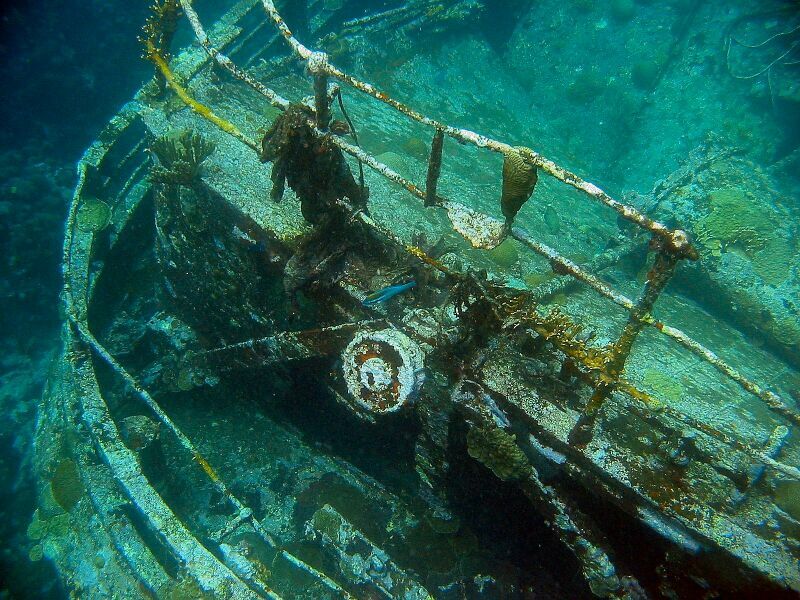 They suggested he could anchor off the southern tip of the bay (where it is heavily filled with coral). They also said they don't want their US dollars as it doesn't help their EC money. Now, obviously these guys were a bit juiced up with Friday afternoon drinking. But, it was certainly a disturbing example of local lack of understanding of what drives their economy - or even basic financial education. Wilson decided it would be better to anchor elsewhere. While we were talking at HC we had a visit from a very tan Frenchman who was a longtime cruiser on another sailboat here. He was offering to sell paintings as a way to supplement his cruising funds. We left HC a short while later with plans to snorkel the next morning. We first tried snorkeling by one of the islands to look for some turtles, but didn't find them. Then we went to some of the good spots inside of the reefs and Wilson's father had a delightful time snorkeling for the first time. Here's a shot of both the Walch dads - can you tell which one has spent the winter in the Caribbean? After taking Victor (Wilson's Dad) back to the boat, Frank took Wilson, Elizabeth, Collin, Lindsey and the girls to the break in the reef. Wilson and Elizabeth loved the snorkeling here as much as we did. After we got back to the boat, Frank quickly burned a CD of the photos he had taken of the snorkeling and other pictures we had taken with Hotel California in the recent weeks. 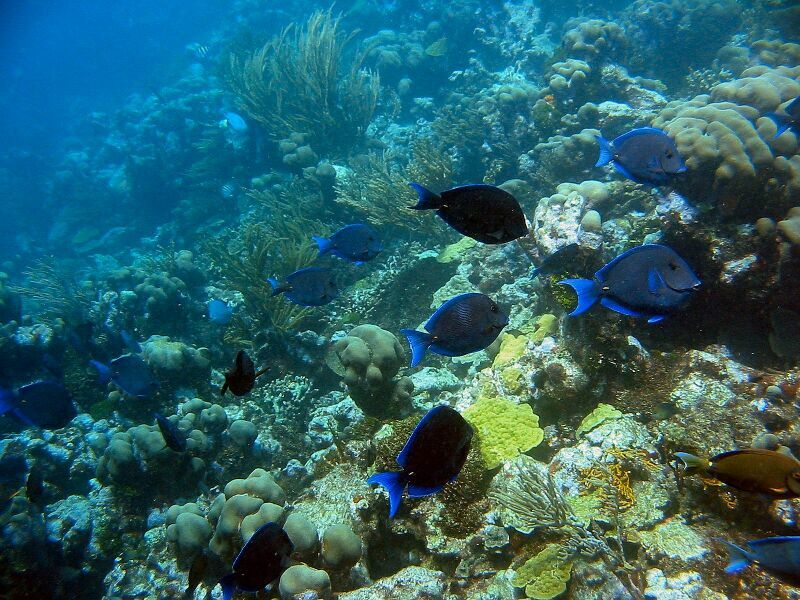 Here's some shots of more snorkeling - some Blue Tangs, can you find the turtle in the second shot? While Frank was burning the CDs another Voyage 440 catamaran arrived in the anchorage. Frank and Karen made a quick trip over to the Voyage boat and met the owners. The boat was called "Sunset Haven" and the owners split their time between the northeast of the US and Puerto Rico. The wife is from Puerto Rico originally and the husband was from Germany originally. They have four grown daughters. We were only able to spend a few minutes as we had to leave. We went back to HC and picked up the girls and said Au revoirs to them. Then we weighed anchor and had a good sail back to Bequia. We averaged over 7 knots and arrived by 4 PM after 25 miles of sailing. As we were arriving, we thought someone hailed us on the VHF. But, it turned out to be someone else. However, someone else heard us - it was Pegasus - the boat we heard from in Martinque. They were also arriving into Admiralty Bay, Bequia. We agreed to come visit as soon as we arrived. Frank dropped off Karen and one of the girls on Pegasus while the other girl took him ashore by dinghy to clear customs. It turns out that although customs is open until 6 PM, they charge overtime fees after 4 PM - that wasn't in our cruise guide. So, $30 EC later he was cleared out of customs - in more ways than one. The good news was that the customs guy told Frank about a better Internet cafe. This one is above Bosun's Locker and has a very fast connection, and convenient ethernet hookups outside at the tables overlooking the beach. Frank got a quick weather update and checked E-mail, etc. Frank then hailed Pegasus and one of the girls came back with the dinghy to pick him up. We spent a couple of hours chatting with Pegasus, but then had to leave so we could all get some dinner. We also had to prepare for an early morning departure. We planned to sail straight up to Rodney Bay, St. Lucia and hopefully get the anchor windlass repaired by the metal worker we had used to repair our stanchion a couple of months earlier. Read about our passage and repair story in St. Lucia Part II.